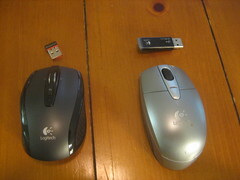 My logitech V200 mouse is more than 3 years old. Recently it acts a bit strange, basically the clicking does not work very well: for instance, when I intended clicking once, it will click twice, vice versa. So I was looking for a replacement for some time. I found the VX Nano is a good one. VX Nano (link to amazon): July 8, 2009, $55.19, the free shipping from Amazon is fast: ordered on July 8, received it on July 10. Logitech offers mail-in rebate on this product from time to time, but not on the day I placed the order. The new VX Nano is usable instantly after I plug in the tiny receiver, and put battery into mouse. The click experience is very good. The tiny receiver makes it possible I don’t need to remove it everytime when I put laptop in a bag (note the mouse also has a button to turn of battery power), both are not available for the old V200 mouse. NRG Energy: a better way to play Buffett?